For more than a year, President Donald Trump has lamented Jeff Sessions‘ decision to recuse from oversight of special counsel Robert Mueller’s investigation into Russian meddling during the 2016 campaign. Chief of Staff to the Attorney General Matthew Whitaker attends a roundtable discussion with foreign liaison officers at the Justice Department in Washington, Aug. 29, 2018. 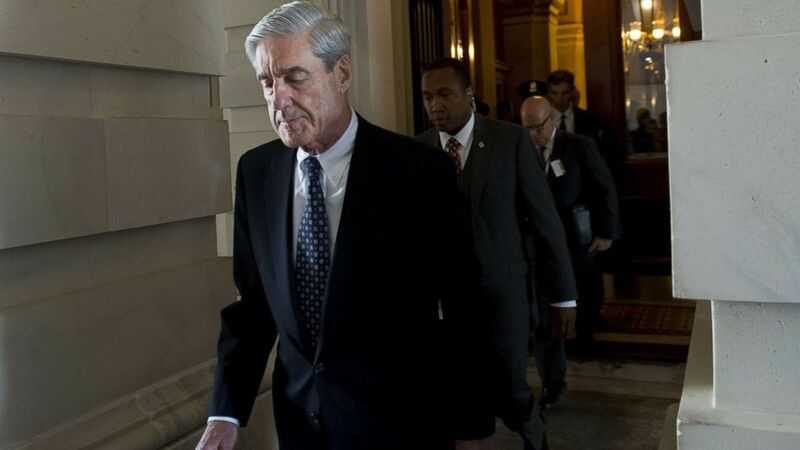 Mueller and his team of prosecutors are already in the process of writing a final report, according to multiple sources, as ABC News reported this week. But as Trump’s growing list of potential candidates for the post emerge, ABC News took a closer look at what frontrunners for the job have said about Robert Mueller and his investigation. Iowa Republican senatorial candidate and former U.S. Attorney Matt Whitaker waits for the start of a televised debate in Johnston, Iowa, April 24, 2014. Since his appointment as acting attorney general earlier this week, Whitaker’s past criticisms of the Russia investigation have been widely reported and scrutinized. A former CNN legal analyst, Matthew Whitaker has publicly and repeatedly aired his concerns about Mueller’s broad mandate to investigate members of Trump’s inner circle and cast doubt on alleged wrongdoing by the Trump campaign. “It is time for Rosenstein, who is the acting attorney general for the purposes of this investigation, to order Mueller to limit the scope of his investigation to the four corners of the order appointing him special counsel,” Whitaker added. In June 2017, less than a month after Mueller’s appointment as special counsel, Whitaker went further in a radio interview with the Wilkow Majority Show. “The truth is there was no collusion with the Russians and the Trump campaign,” Whitaker told the show. Whitaker’s appointment as acting attorney general has caused congressional Democrats across the board –- and even some moderate Republicans –- to call for his recusal from oversight of the investigation. Those calls have thus far ignored. Rudy Giuliani, former New York City mayor and current lawyer for U.S. President Donald Trump, speaks to members of the media at the White House, May 30, 2018 in Washington. As President Trump’s personal attorney dealing with the special counsel’s probe, former New York City Mayor Rudy Giuliani has had a front row seat to the Russia investigation. Since joining Trump’s legal team in April, Giuliani has been a staunch supporter of the embattled president, repeating Trump’s characterization of Mueller’s probe as a “witch hunt” and “the most corrupt investigation” he has ever seen. Giuliani has repeatedly claimed that there was no collusion. “Everything that’s been released so far shows the president’s absolutely innocent. He didn’t do anything wrong,” Giuliani told “Fox and Friends” in July. Giuliani has led the charge in calling for an expeditious end to Mueller’s investigation. As part of his role on Trump’s legal team, Giuliani is helping craft written responses to questions from Mueller’s team, sources told ABC News. The former Governor of New Jersey Chris Christie speaks at a political event in Los Angeles, Oct. 20, 2018. As a presidential primary rival, then an early supporter and surrogate for the Trump campaign, former New Jersey Gov. Chris Christie, who is now an ABC News contributor, has had his ups and downs with the president. Christie’s public praise for Mueller, however, has been consistent. Conversely, Christie has taken to criticizing Trump’s repeated attacks on Mueller. Christie met with Trump and his advisers at the White House on Thursday, sources said, where he had a previously-scheduled meeting on prison reform with Trump’s son-in-law and senior adviser Jared Kushner. Sen. Lindsey Graham speaks at a campaign rally for Senate candidate Mike Braun on Nov. 1, 2018, in Mishawaka, Ind. Sen. Lindsey Graham, R-S.C., expected to take over as the chairman of the Senate Judiciary Committee in the new Congress. Instead, the Trump confidante has emerged as a legitimate candidate to take over at the Justice Department. For months, Graham has led the charge in calling for the appointment of a second special counsel to investigate the Department of Justice and the FBI. Graham has raised ethical questions about Justice Department official Bruce Ohr for investigating the president while his wife, Nellie Ohr, was working for an opposition research firm that produced a controversial dossier on then-candidate Trump. Both Bruce and Nellie Ohr have been called to testify before Congressional committees that continue to investigate allegations of bias at the FBI and DOJ. In August, Graham said during an event hosted by the Greenville County Republican Party that he told the president that he has found “zero evidence” of Trump’s collusion with Russia, NBC News reported. Graham, however, has repeatedly advised Trump against ending the investigation, saying the move would hurt the Republican Party in the midterms. “I told the president this: I promise you, you’ll be treated fairly. I promise you that the people who put the Clinton investigation in the tank, they’re going to have their day too,” Graham said. Attorney General for the State of Florida Hon. Pam Bondi speaks onstage during an event in New York on Sept. 25, 2018. A longtime Trump ally, Bondi was considered for a Justice Department position during the transition, sources told ABC News. And with her term as Florida’s attorney general ending in January, she may be in position to become the nation’s next chief law enforcement officer. In the wake of revelations that former FBI investigator Peter Strzok and former FBI lawyer Lisa Page exchanged anti-Trump text messages during the campaign, Bondi suggested that Mueller’s investigation was tainted with partisan motives. Strzok was dismissed from Mueller’s team after the text messages were discovered. Rep. John Ratcliffe pauses while speaking to members of the media on Capitol Hill in Washington, Oct. 25, 2018. President Trump frequently relies on House Republicans to defend him on Capitol Hill, and Rep. John Ratcliffe has been a loyal foot soldier on the front lines. Ratcliffe, a Texas Republican who sits on the House Judiciary Committee, has made no secret of his qualms with Mueller’s appointment, often airing them on Fox News and other cable outlets. But despite his frequent criticism of the special counsel, Ratcliffe has stopped short of calling for Mueller’s dismissal. The presidents’ aides have floated the idea of the former attorney general retaking his post in the Justice Department, sources told ABC News this week. While William Barr has written frequently about those involved in the investigation, he has remained neutral on the legitimacy of Mueller’s probe.